Welcome to my Nutrition Blog! Laura Frese, MMS, PA-C, RD received her bachelor’s degree in science nutrition and dietetics at Saint Louis University in St. Louis. She then finished her physician assistant studies and master’s degree in medical science at Northwestern University in Chicago. She is a certified physician assistant and registered dietitian who is trained to provide low risk obstetric and gynecological services including prenatal care, pap smears, contraceptive counseling, and STD prevention and treatment. Laura is uniquely trained to help teach, mentor, and advise women on nutrition and overall health. We are excited to have Laura head up a program where our patients will get more than just the general, “one-size-fits-all” nutritional counseling. For prenatal nutrition, general health, or weight loss, she is an excellent guide for counseling of effective nutritional and lifestyle habits that will assist patients throughout their lives. She is an active member of the American Academy of Physician Assistants and the Academy of Nutrition and Dietetics. National Nutrition Month focus of the week is DAIRY! While dairy sometimes gets a bad rap, dairy products are excellent sources of calcium and vitamin D — two nutrients that are really hard to get in appropriate amounts from any other food groups. Calcium is important for strengthening bone health, which helps prevent osteoporosis later in life — a health condition that women are an increased risk of, especially after menopause. Dairy also contains a good amount of protein, which helps maintain our lean body mass (muscle!) and keep us fuller for longer. Foods in the dairy group include milk, yogurt, cheese, and milk-based desserts (pudding, frozen yogurt, ice cream). Women should aim for 3 servings of dairy products each day to ensure they are getting enough calcium in their diets. Choosing dairy products that are low in fat and sugar will provide the most nutritional value, without adding to your waistline. Try consuming smaller portions. Sometimes doing 4 oz. of milk at a time, instead of a full 8 oz. glass, is easier for the tummy to tolerate. Opt for a lactose-free or reduced-lactose product, such as Lactaid brand milk. Or buy Lactaid tablets from the drugstore to take prior to eating a dairy-containing meal or snack. Choose calcium-fortified non-dairy products. Soy milk is a great option, since it has a good amount of protein, like dairy does. Almond milk is also fortified to match the calcium in dairy, but lack protein. If you choose to avoid dairy altogether, or do not get 2-3 servings per day, there are other ways to meet your daily calcium needs. Leafy green vegetables, such as kale, have a small amount of calcium — but you need to eat A LOT each day. Adding a calcium + vitamin D supplement daily is a great option as well. There are millions of healthy and tasty ways to add dairy to your diet. Cook your oatmeal in milk. Top your pancakes or waffles with a yogurt sauce instead of syrup or whipped cream. Top scrambled eggs with low-fat cheese. Stir skim milk into your morning coffee. Build a parfait with low-fat yogurt, fresh berries and whole grain cereal. Add a slice of low-fat cheese to your sandwich or wrap. Cook up a pot of low-fat broccoli cheddar soup. Make a veggie dip from fat-free greek yogurt mixed with herbs and spices. Stir up a fruit salad mixed in a yogurt dressing. Blend yogurt with frozen fruit for a tasty smoothie. Build skewers with low-fat cheese cubes and fresh fruit. Add a piece of string cheese to your snack lineup. Stir fat-free greek yogurt into your homemade guac for extra creaminess. Whip up a batch of tzatziki (a Greek dip featuring fat-free yogurt, cucumbers, lemon juice, dill and other herbs) to dip veggies and pita chips into. Click here to check out some calcium rich foods! National Nutrition Month continues! This week, let’s talk fruits. Fruits are overall excellent sources of vitamins, nutrients, fiber and natural sweetness. While important to include in your daily diet, it is possible to overdo it. Because fruits contain natural sugars, the carbs and calories can add up quick. But with proper portion sizing, fruits can be a super-healthy and sweet-tooth-satisfying part of your diet! Women should aim to eat 1.5 to 2 cups of fruit daily. Fresh or frozen fruits are the most nutritious options. Beware of canned fruits that are packed in sugar-sweetened juice, of dried fruits that almost all have added sugar (except raisins! ), and of fruit juices that have all the fiber taken out. Just like with vegetables, it is great to vary the colors and textures of your fruits — melons, berries, citrus, apples, peaches, bananas, grapes. The more variety the better! Keep a fruit bowl on the counter or on a visible shelf in the refrigerator. If it’s in your line of sight, you’ll be reminded to eat it! Cut up fruits into individually portions bags or containers for easy grab-and-go snacks. In addition to fresh fruits, keep some frozen or canned (in water or 100% juice only) in the house so you always have a supply on hand. At breakfast: Add blueberries, bananas or peaches to your pancakes, cereal or oatmeal. Build a yogurt parfait featuring your favorite fruits. Throw frozen fruits into a smoothie. At lunch and dinner: Add a piece of whole fruit (apple, pear, banana, orange) to your lunch bag. Top salads with fresh or dried fruits. Try entrees that feature fruit, such as chicken with apricots, or a sweet and sour stir fry with pineapple. Each week this month, I’ll plan on focusing on a different food group. 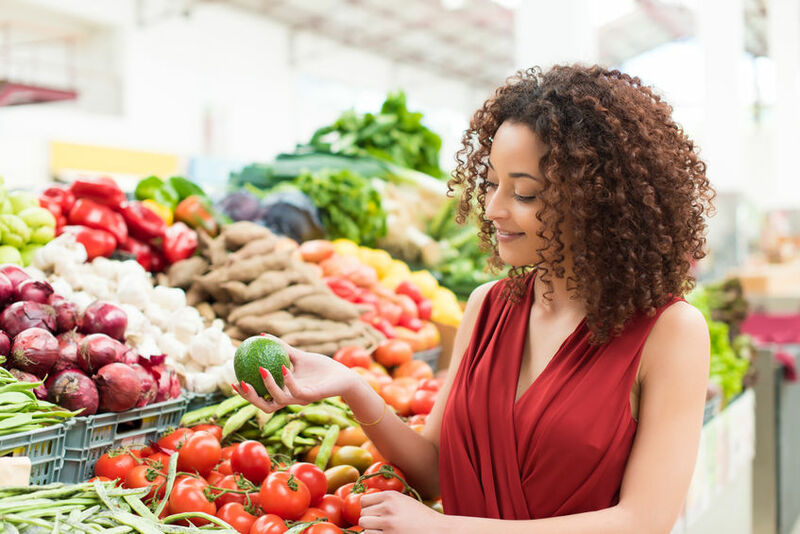 The weekly blog posts will highlight new foods and recipes to try, and hopefully help expand your palate to include more colorful, nutrient-rich foods in your diet. This week, let’s focus on VEGETABLES! Women should aim to get 2-1/2 cups of vegetables each day, including a variety of colors and textures from the groups above. Buying vegetables that are in-season will ensure that they are the freshest, the best-tasting, and the cheapest! Sometimes it is worth the extra money to buy vegetables that are ready to eat, such as baby carrots, pre-cut lettuce, frozen broccoli. When all you have to do is open a container or throw a bag into the microwave for a couple minutes, there is no excuse to NOT add a veggie to each of your meals. Do you worry about feeding veggies to your picky eaters at home? Try adding a small amount of sauce or dip to the vegetable to make it tastier and more fun to eat. Reduced-fat salad dressing, a side of flavored hummus, or a sprinkle of cheese can go a long way. And if a little ranch is the difference between veggies going in a tummy (instead of in the garbage! ), it’s worth it. You can also try “hiding” vegetables in other dishes to make it even easier to up your daily intake. Used pureed, cooked vegetables (such as potatoes) to thicken stews or gravies. Add shredded vegetables, such as carrots or zucchini, to meatloaf, casseroles, and muffins. Throw some fresh spinach into a smoothie. The flavors of the fruit overpower the veggie flavor, and just leave with a smoothie that’s funny colored, but still delicious! 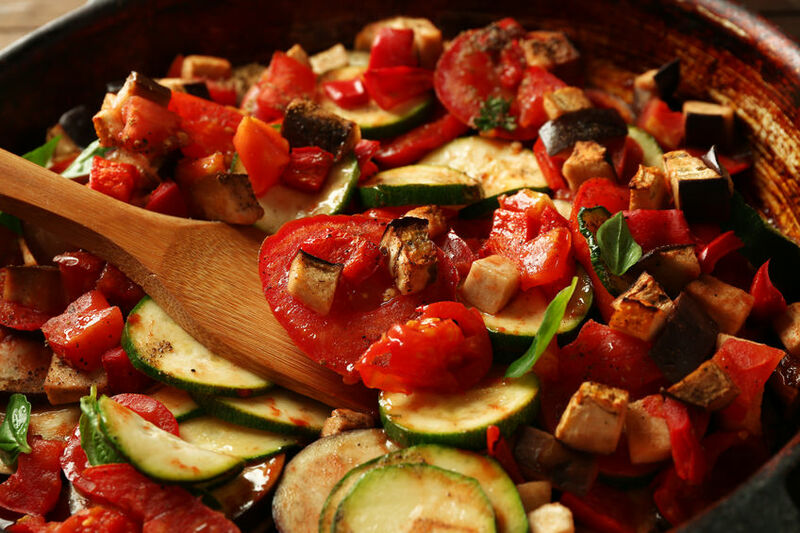 Load your summer farmers market haul into the slow cooker for a delicious ratatouille that you can use in a variety of ways. Serve as a side, over pasta or bread, with a grilled protein or even in an omelet. Add all ingredients except basil into a large slow-cooker, cover and cook. Cook for 3-4 hours on high or 5-6 hours on low). The ratatouille is ready when the vegetables have softened, but aren’t mushy. If you’re worried about the ratatouille being too watery, remove the slow cooker lid and cook on high for the last hour. Just before serving, gently stir in fresh basil. Serve warm or cold as a side or over a whole grain like quinoa or rice as a main entree. Here are some strategies to help avoid weight gain, while still attending your holiday festivities and indulging in a few of your favorite treats. Have a plan. Just as you plan out your outfit, hair and manicure for big holiday parties, it’s important to go into these events with a food plan as well. Is there a buffet at the party? Make one pass by without a plate to survey all the available offerings so that you can choose wisely. Are there any fruit and vegetable offerings? Scope them out and fill half your plate with those light, fresh options before moving on to the more decadent or indulgent treats. Will there be multiple courses? Set a limit for yourself on the number of appetizers you’ll take, what portion of entrée you dish out, etc. so that you don’t overindulge. Limit alcohol intake. Not only does alcohol increase your appetite and lower your inhibitions, it’s also full of empty calories that add up fast. Studies show that the more people drink before food is served, the more likely they are to eat larger portions and to choose richer, high-calorie foods. Don’t show up hungry. Many party-goers try to “save” calories throughout the day by skipping meals or snacks, but this plan can often backfire. The more hungry you are upon arrival to a party, the more likely you are to overeat. Hunger tends to make us eat too much, too fast. Instead make sure to eat a healthy meal or snack before the party to tide you over. Options like pistachios, Greek yogurt with berries, or vegetable slices with hummus provide protein and fiber to help you feel full longer. Allow yourself to enjoy. Deprivation is definitely not your friend. When you tell yourself a food is off limits, it can make you crave it more. Psychologist Carl Jung put it perfectly when he said, “What you resist will not only persist, but grow in size.” Decide what your favorite holiday indulgence is, and account for that in your party plan. If you have a sweet tooth like me and crave dessert, make sure to save room. If you know throughout a meal or party that you want to save room for dessert, you’re less likely to eat mindlessly and wind up stuffed at the end. When you do allow yourself your allotted indulgence, make sure to really enjoy it. Take your time, eat slow, savor each bite, and stop when you’re satisfied – NOT when you’re miserably full. Make time for exercise. For more tips on fitting a fitness routine into your busy holiday schedule, see my other new post! Track your food. Research has shown time and time again that individuals who track what they eat lose more weight than those who don’t. Whether your goal is to lose weight or just prevent weight gain during the holiday season, keeping a detailed food journal is essential. Free online/app tools such as MyFitnessPal (www.myfitnesspal.com) can make it easy to track your food no matter where you go during the holiday season. By being aware of what you’re eating, you’re more likely to stay on track with your goals. While many people call the weeks between Thanksgiving and New Year’s Day “the most wonderful time of the year,” they can also easily comprise the most HECTIC time of the year. It’s also the most common time of year for our nutrition and fitness goals to become low-priority, and for unwanted weight gain to start accumulating. One way to both combat the stress of holiday madness AND the excess calories from holiday parties is to make sure you stay active in the weeks ahead. Here are a few tips to keep you and your family moving this holiday season. Schedule your exercise. When our calendars are filling up with holiday parties, hair & nail appointments, travel reservations and more, we must stay diligent about making time for self-care, including exercise. Block out some time on your calendar for physical activity, and make it as important as you would a doctor’s appointment or business meeting. Not only will this help fight holiday weight gain, it will also help reduce holiday stress and may boost your energy levels during this busy time of year as well. Start a friendly competition. Does your family all have FitBits, pedometers or at least a step tracker on their smart phone? Start up a challenge to see who can accumulate the most steps during the week between Christmas and New Year. Either have everyone throw a few bucks into a pool that the winner will earn, or get creative with the prize. May be the winner gets out of dish clean-up, or gets to open a present from under the tree a few days early. Make fitness an annual tradition. If you and your family exchange gifts during the holidays, make an effort to include a gift that promotes physical activity – and make this type of gift a new annual tradition. Whether a new basketball, jump rope, or a game that encourages movement, add something fun to the mix. Plan an hour or two into your day where everyone has to take a break from their screen time or new toys to engage in some physical activity together. You’ll make fun memories AND improve your fitness, so it’s a win-win for everyone! For more ideas, visit www.myfitnesspal.com. Happy Holidays!